After hard work and everyday stress, you must have had a wish to relax and recharge your batteries somewhere far from home and gloomy worries. Holidays are near, you will have some more free time, so why not treating yourself with a chance to relax, enjoy and have a whale of time. In case you’re still indecisive about the way you could spend your free time, Novi Apartmani have a suggestion for you – spend your holidays in Belgrade. Whether you are single, couple, part of a larger group of friends or family, pack your suitcase and don’t forget optimism and curiosity and head to Belgrade. You have no idea what Belgrade can offer you. Choose Belgrade for its people.People in Belgrade are famous for their hospitality. They are easy going, sociable and helpful, and Belgrade will always make you feel at home. Choose Belgrade for the best nightlife.A couple of years ago, Belgrade was proclaimed as the city with the best nightlife in the region. People in Belgrade try to have good time at all times – day and night, each day in the week. One may rightly say that each day is Friday in Belgrade. During the day, people enjoy in cafés, and in the evening, a night out starts in river clubs, discotheques and taverns. Choose Belgrade for affordable services.When compared to the rest of Europe, services in Belgrade are very affordable. This particularly refers to food, drinks, accommodation. Choose Belgrade for its gorgeous girls.When Belgrade is mentioned, the first thing that springs to foreigners’ minds is the beautiful girls of Belgrade you can see every day in the streets of the city. Choose Belgrade for the programme offered to you. What can Belgrade offer in the holiday season? 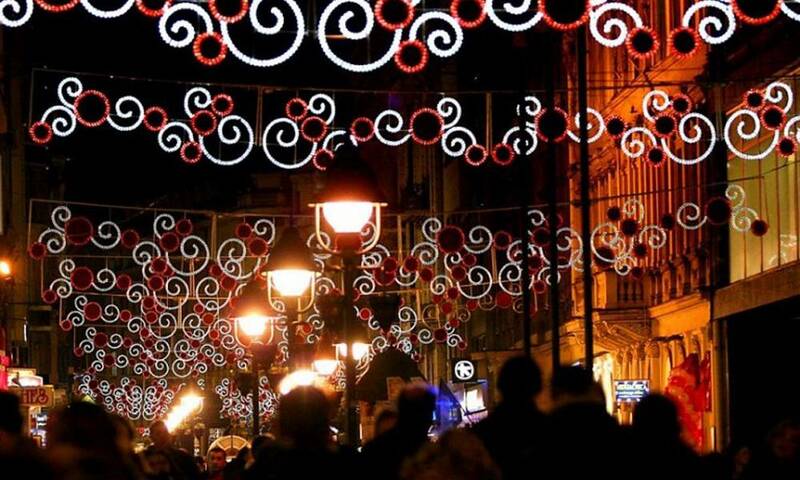 This year, Belgrade offers a whole month of different events, starting on 14th December, by opening the Square of open hearts, which will stretch from the Republic Square, along the Knez Mihailova street. The first day of holiday events will start by turning on the New Year lighting and the Christmas tree located at the Republic Square. The concert of Global Warming orchestra is planned to take place there, as well as the brass orchestra, DJs and folklore ensemble, including the theatre play for kids. From December 15- January 15, theatre plays for kids will take place every day. In addition to the stage for children, there will be a “Christmas market” with a working time 10-23h. Along the most beautiful street in Belgrade, Knez Mihajlova street, stalls will be placed, working every day until 18h. Three stages were planned for the New Year’s Eve in Belgrade. The first will be set in Studentski trg and is reserved for DJs. The other stage in the Republic Square is reserved for rock bands, and for all those who enjoy pop-folk music, the third stage will be set in front of the Parliament building. For all those fond of shopping in Belgrade, it may be interesting to remember that in the period 25-27 December a Shopping Night will take place in Belgrade, where you can buy designer clothes at lower prices.